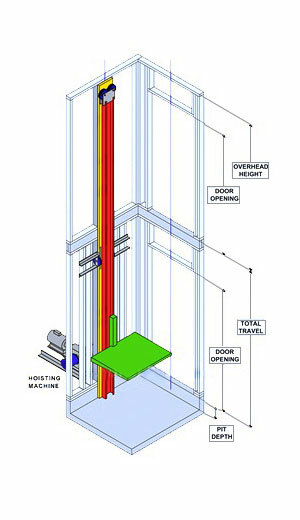 While you won't see it, the drive system that powers your home elevator is one of its most important components. Inclinator offers 3 powerful and reliable elevator drive systems to make sure your trip between floors is smooth, safe and convenient now and for many years to come. In fact many of our home elevators have been in operation for decades with just a bit of minor maintenance. We recommend working closely with your dealer, architect or builder to determine the best drive system for your needs, but we've listed some highlights and specifications for all of our drive systems below to give you the basics. The cable drum drive system is our most compact drive system, using a patented, space-saving monorail guiding system. 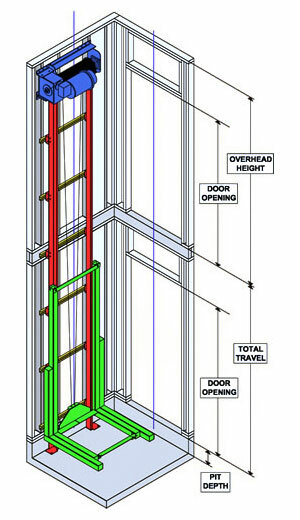 It is also the quietest cable drum elevator in the industry and can accommodate up to 6 landings. * This system requires additional space to house the drive system equipment. This provides easier access to the drive system components for maintenance and repairs. Featuring our patented HydraRide system, our hydraulic drive system offers a smooth ride and quiet operation using much less hydraulic fluid than other hydraulic elevator brands. Built for a quiet, smooth ride, the MRL overhead cable drum drive system runs on two custom-formed guide rails for increased stability. Featuring the lowest minimum distance between floors, the MRL overhead cable drum drive system is perfect for split level homes. Travel distance up to 40 ft. 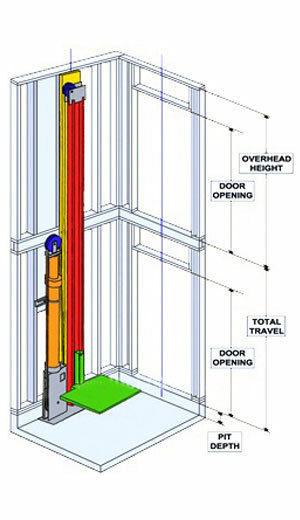 Overhead distance for a standard cab at 40 fpm is only 8' 9"
Overhead distance for a standard cab at 30 fpm is only 8' 6"
Pit depth of only 8"
* Our MRL (machine roomless) drive systems are housed entirely in the shaft way of your elevator system. This means they require less space to install, since they don't require a separate room to house the equipment. Inclinator's elevators meet or exceed the requirements of ASME A17.1-2016/CSA B44-13 safety codes for elevators and escalators. Consult your local building authorities for specific regulations on these products before purchasing.